Prevail Premium Quilted Washcloths With Lotion - Tub or Refill, 12" x 8"
Prevail Premium Quilted Washcloths, 12" x 8"
Single Hand Dispensing: By combining pop-op washcloth folding and a special S-lid design, a Caregiver, with one hand, can pull a single unfolded washcloth each time. Adding convenience and savings while reducing prep time and waste. Tri-Form Fabric: A unique three layer fabric: the two outer layers are made of a soft fabric to be gentle on the skin; the strong and thick inner layer prevents tearing or stretching for effective cleaning and for keeping hands cleaner. Quilted Texture: The texture of our Quilted Washcloths creates pockets for a complete cleaning using fewer washcloths. This unique feature enhances pericare. Single-Hand Dispensing® - By combining pop-up folding and a special lid design, a Caregiver with one hand, can pull a single unfolded washcloth each time without reaching in, adding convenience and reducing waste. Easy To Use. Moisturizing. Cleans Effectively. Pleasant Smell. Long Lasting. Exactly what we needed. No complaints at all. Performs as promised, and I'm sure we'll be buying more in the future. Easy To Use. Moisturizing. Cleans Effectively. Like the size. Pleasant Smell. Use for an incontinent husband; size is great; leaves a pleasant odor and leaves skin soft. Moisturizing. Pleasant Smell. Easy To Use. Durable. Easy To Use. Moisturizing. Cleans Effectively. Pleasant Smell. Long Lasting. Does not tear. Used on elderly for cleanliness. Easy To Use. Moisturizing. Cleans Effectively. Pleasant Smell. Long Lasting. Good size. Large enough hold. Budget Buyer. to please my wife. She likes the softness. We use these wash wipes to clean up after potty breaks instead of paper. May cost more but more effective and softer. These wipes work really well but they do smell rather feminine. Sorry I can't help you further. 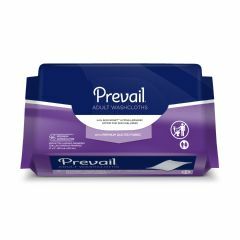 We use the TENA adult wipes and they don't seem to have the strong perfume scent that the Prevail wipes do. I think they have a fresh clean smell that does not last very long. Answered on Feb 26, 2013 4:37:41 PM by Chet from VA. I use many of these washcloths per day to meet my wife's hygienic needs. They are just fine. I can not smell any feminine odor from them and would not hesitate to use them myself. My husband has had a stroke and is paralyzed on one side. The wipes are helpful in cleanups from potty breaks. They have a clean smell, not feminine. I use these wipes on my husband who is bedridden. They are nice and sturdy with no fragrance. The fragrance is most decidedly feminine. It is rather heavy for my tastes. I prefer the one in the blue pkg. The fragrance is lighter.